It is with great pleasure that Elmvale District High School hosts the Elmvale Maple Syrup Variety Night. This wonderful evening provides a venue to showcase home grown talent. If you wish to perform during the evening, please contact EDHS at 705- 322-2201 for more information. 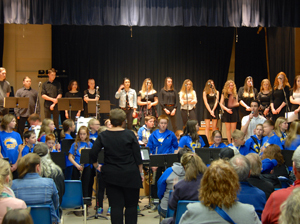 The Elmvale Maple Syrup Variety Night has become another of the many reasons why Elmvale and surrounding area is such a vibrant place to live. Come out and support your community! The Elmvale District High School refit is nearing completion and they are thrilled to announce that the new gym is ready for this year’s Variety Night presentation. Doors open at 6:30 p.m. for the Student Exchange Silent Auction.